Come stand for the wolf, join other wolf advocates and tell your lawmaker to protect the wolf. 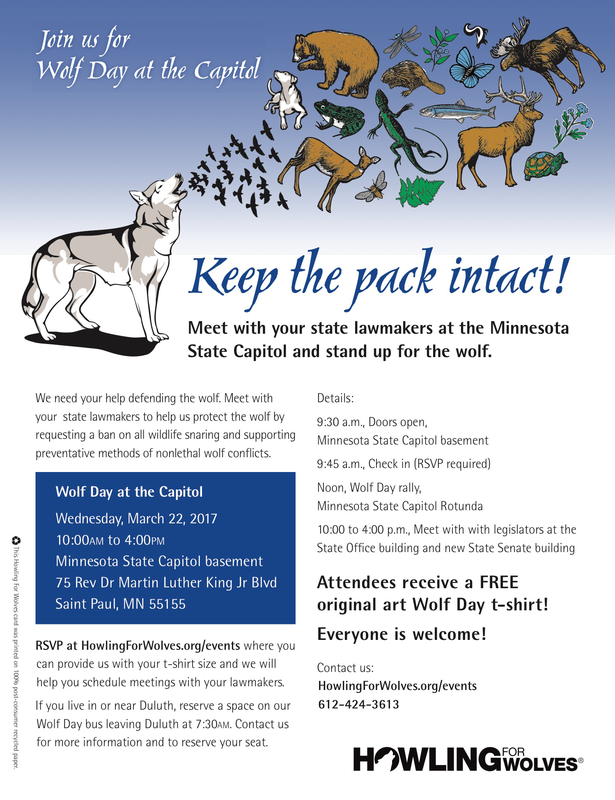 Minnesota’s and the Great Lakes wolves need us to advocate and speak for them with Minnesota state lawmakers in St. Paul. The wolf may soon lose federal protections and the drum beat for wolf hunting that uses cruel methods will begin again. This 2017 legislative session we intend to introduce bills that include but are not limited to supporting nonlethal wolf livestock conflict prevention methods and eliminating all wildlife snaring. This is the first year of the two year session. As a Constituent, you are vital to persuade lawmakers to protect the wolf. The wolf needs us to speak for her and her pack. Please accept our new shirt designed just for this day. While we know some people may not want a new shirt, we ask that everyone wear a wolf shirt (older ones too) to let lawmakers know we are there for the wolf. We will have a bus from Duluth and encourage people to relax for the trip and take the bus. Volunteers are needed before and on Wolf Day. We need people to help with set up and take down and distributing materials and others willing to stand in places throughout the office buildings to be seen and to direct people. Click HERE for more information about Wolf Day. Click HERE to download and share the Keep the pack intact poster.